YOUR SEARCH FOR THE FINEST, SNOW FLOCKED ARTIFICIAL CHRISTMAS TREE IS FINALLY OVER! 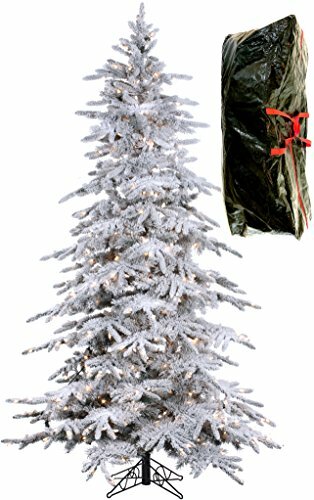 THIS LIFELIKE, NATURAL LOOKING TREE IS DESIGNED TO ALLOW FOR EXTENSIVE DECORATIONS, AND HAS LIGHTING THAT STAYS LIT EVEN IF THERE IS A BURNED OUT BULB! HOW DOES THIS TREE MAKE YOUR HOLIDAY SEASON FEEL BETTER? ● The tree will look like the "true white" snow color you wanted when you ordered it. ● Your ornaments can be seen throughout the tree, not just hanging on the outer ends of the branches. ● You won't spend time trying to find a burned out or missing bulb, the lights will look terrific every day. ● When friends or family see the tree, especially at night, they will smile and tell you it looks absolutely beautiful. THIS TREE HAS BEEN REFERRED TO AS A "DESIGNERS DELIGHT" BY PROFESSIONAL DESIGNERS AROUND THE COUNTRY! ● The advanced, patented STAY-LIT lights use the latest technology (microchip in each socket) so that the lights stay lit even if a single bulb is burned out, broken, or missing. Do not be fooled by imitations. ● The flocking on the tree is a "true white" color, made in the USA and of the highest quality. All flocked tree photos look white, but this tree IS white and doesn't fade with time. ● The tree design is preferred by designers because the branches are layered, which allows you to "decorate with depth". Most flocked trees are too full and ornaments can only be hung on the outside edges of the branches. Now you can place ornaments throughout the tree, including closer to the trunk. ● You'll have piece-of-mind knowing your family is safer, because both the tree and the flocking are flame retardant. ● As a bonus it comes with a zippered storage bag with handles, for easy put away. THIS PRICING CANNOT BE GUARANTEED, SO BE SURE TO CLICK "ADD TO CART" NOW! NO MORE WORRY ABOUT AN ENTIRE STRAND OF LIGHTS GOING OUT! With the patented STAY-LIT lights the secret is the chip in each socket, not the bulb or the wire. This advanced microchip technology keeps the entire strand lit, even if there's a burned out or missing bulb. With 600 clear lights your pre-lit tree will dazzle all who see it, especially at night. NO DISAPPOINTMENT WITH GETTING A GRAY-COLORED WHITE! This flocking is a "true white" color, made in the USA and of the highest quality. It won't fade and is not the gray-colored white that is common with other flocked trees. Experience the feeling of a clean, fresh snowfall whenever you look at this 54" wide tree. It also comes with a zippered storage bag for easy put away. DECORATE WITH CONFIDENCE knowing the branches won't sag or bend, as they're constructed with metal hinges and heavy gauge wire. The center pole provides a sturdy, solid trunk and is supported with a folding metal stand. At 7'6'' tall and 54" wide, the tree is large enough to give you a WOW when decorated, and yet will fit comfortably in most any area. ADORN YOUR TREE LIKE A DESIGNER because with this flocked tree the branches are layered. This allows you to place ornaments deep into the tree and not just on the outside like most. Your tree will be fuller and much more elegant looking. FEEL GOOD KNOWING THE FOLIAGE OF YOUR FLOCKED TREE will look natural and lifelike, as if covered with freshly fallen snow. The 1,300 tree tips accurately mimic a natural Bavarian Pine. They're created using a special, unique method that makes them look more realistic and natural, as if freshly cut from an Alpine mountainside. If you have any questions about this product by Fine Expectations, contact us by completing and submitting the form below. If you are looking for a specif part number, please include it with your message.